I have previously posted about fitting a Flat Earth sailing rig to a P&H Aries 155 but on taking delivery of a new Aries with forward fin I decided to use a slightly different method which I have outlined here. We have been increasingly paddle sailing in stronger winds often going on down wind shuttle runs. Until now I have used the forestay/up haul with two side stays mounted on either side of the mast for maximum stability and a single back stay. 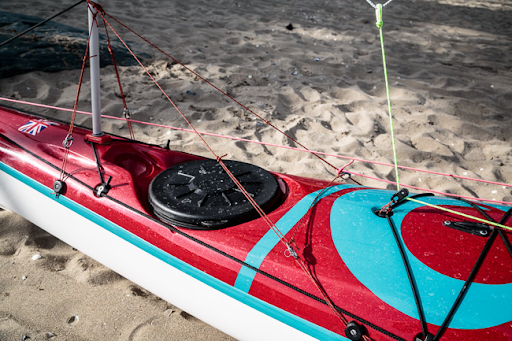 This time I have replaced the single centrally mounted back stay with two back stays mounted on the kayak seam which is the strongest part of the kayak. 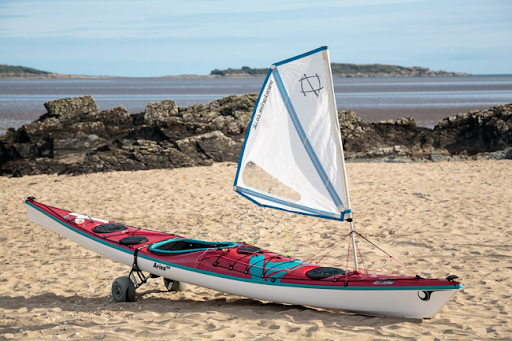 This also has the advantage of having one of the stays directly in line with the wind direction when paddling on a broad reach which is one of the most fun directions. I got this idea from Mick McRobb who is the brains behind the Flat Earth rig. I like to get the side stays at right angles to the centre of the mast foot and as far out as possible to give maximum support. I use surface deck fittings to secure small loops of 2mm Dyneema cord to which the stays are attached by 32mm snap shackles. The SDFs are attached by M4 stainless steel bolts which mean one 4mm hole needs to be drilled for each. A stainless steel penny washer helps spread the load inside but note the pull of the stay is almost at right angles to the bolt. I like to have an adjustable grip hitch on a loop to the snap shackles as this lets me get the tension of the stays just right. 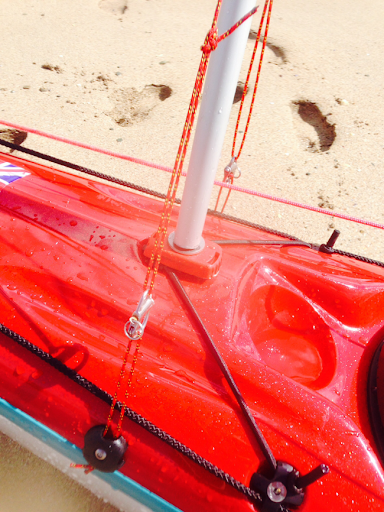 It also means I can transfer the rig to several different kayaks. These SDFS fittings give a very strong mount that will not break under pressure. 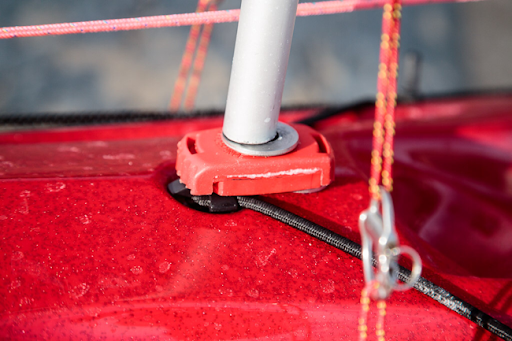 If using these you need to be very careful that your deck and seam are strong especially if you capsize and attempt to right the kayak without letting the uphaul or sheet off. Water exerts a much greater force on the sail than air! If you have any doubts I suggest using the deck fittings supplied by Karitek either separately or as part of their fitting kit. These are also secured with a single bolt but the side stay does not wrap round the bolt as happens in the fittings I use. The Karitek fitting is made of plastic and will shear before your deck breaks (unless you have a very lightweight layup). P&H supplied this Aries with a reinforced deck from in front of the forward hatch to near the bow. The Aries bow is peaked to help with resurfacing so P&H also supplied a shaped spacer to mount the red Flat Earth deck plate on. I chose not to use it and mounted the deck plate using one of the deck elastic RDF mounts. I removed the existing M6 countersunk SS RDF bolt and replaced it with a longer 40mm pan head M6 SS bolt which goes through the front deck plate mounting hole and the RDF. I then mounted the rear Deck plate hole with an M5 pan head bolt and 2 penny washers above the deck/below red plate and one below the deck. This required a new 5mm hole to be drilled. The two back stays can be seen clearly here. 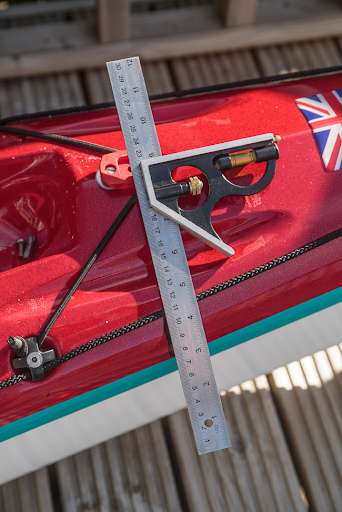 If you have an aversion to drilling, you could just use the existing lateral deck elastic RDFs to mount the stays to but I thought the best angle to give maximum support on a broad reach was a bit further forward and as I like drilling holes in boats I went for it! To prevent the snap shackles rubbing on the deck when the sail is launched and loaded I have made the loops round the two back stay SDFs a bit longer. When the sail is folded on deck the snap shackles would fall into the water, so to prevent this I have used a short piece of cord to form a saddle between them. When the sail is launched there is no tension in it.